January 13, 1961 – Chief Judge William J. Campbell of the Federal District Court and John W. Chapman, Jr., the head of the Chicago offices of the General Services Administration, pry a brick from the wall of the Great Northern Theater at 26 West Jackson Boulevard, signaling the beginning of demolition work that will clear the site for a new 30-story federal building. The 30-story courthouse, with Ludwig Mies van der Rohe, the lead designer, directing a team of Chicago architecture firms Schmidt, Garden and Erickson, A. Epstein and Sons, and C. F. Murphy Associates, will be finished in 1964. It will the first of three federal buildings to sit on a two-block site east and west of Dearborn Street and between Jackson Boulevard and Adams Street on the north and south. The Great Northern Theater is shown in the black and white photo above. The Great Northern Hotel on the left side of the photo was designed by Daniel Burnham and John Root and opened in 1892. It was demolished in 1940. 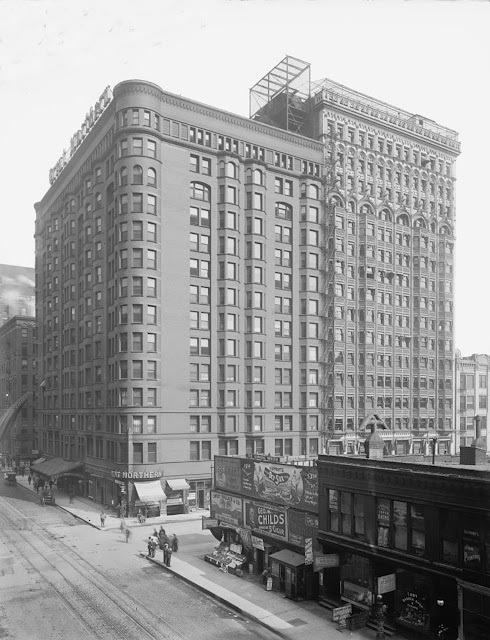 The office building and theater on the right and was designed after John Root's death. While they stood, the two buildings enclosed the largest interior court in the city. 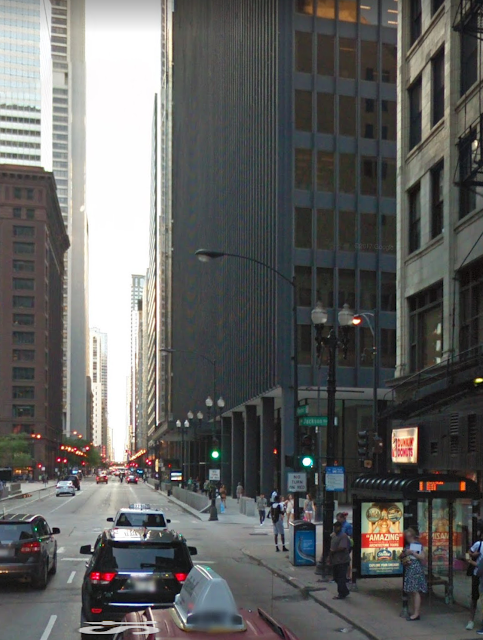 The Dirksen Federal Courthouse which stands on the site today is shown in the second photo. January 13, 1890 -- The Chicago Daily Tribune continues its crusade against the conditions on the Chicago River, especially the area we know today as Bubbly Creek. The paper reports, “There is no perceptible current in it, and for fifteen years, it is claimed, the refuse from the packing houses has been accumulating in it. In summertime silver coin in the pockets of tugmen turns black as the tugs plow through the mass of decaying matter…a novice who takes a tug ride to the South Fork for the fun of the thing never takes another. 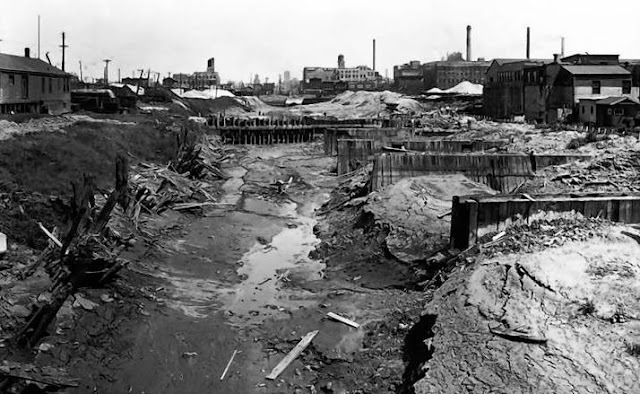 If he recovers from the first trip in a week and can smell clean again he is extremely lucky.” [Chicago Daily Tribune, January 13, 1890] Some aldermen propose doing nothing, saying that the area around the South Fork is mostly occupied by glue factories, rendering plants, and slaughterhouses. Says one alderman, “Why not let the South Fork, with its awful filth, alone? No one scarcely, except the people who are responsible for the filth, is near the South Fork.” The problem, though, is that under the right conditions – a heavy rainstorm or rapid snow melt – the whole mess overflows into the river and is carried to the lake. In July of the preceding summer, after a particularly violent storm, a steamship captain reported that he could trace the mess from the South Fork to the breakwater and from there to a half-mile beyond the intake crib that provided the city with fresh, clean water. What to do? One plan is to allow the packers to continue dumping their stinking brew into the South Fork if they agree to pay for pumping works to send the mess away from the city and into the I & M Canal. The paper takes the simplicity of the plan to task for two reasons: (1) that this solution would mean “that the people of the Illinois River Valley must endure what Chicago gets rid of”; and (2) “if the packers are allowed to use the canal for this refuse the city will be crowded out from sending its legitimate sewage that way, and would be compelled to go to an extremely heavy expense in straightening out the Desplaines River and dredging the Ogden Ditch.” Without parsing the difference between “legitimate sewage” and “illegitimate sewage”, It will be ten years before one of the great engineering projects in United States history sees the river reversed and sent westward away from the lake and the city’s drinking water. Not even that great project, though, will make a difference to the terrible toxic soup that was the South Fork. January 13, 1941 -- In a meeting of 100 civic and industrial leaders at the Chicago Club, the inauguration of a $3 million development program by the Illinois Institute of Technology is announced. 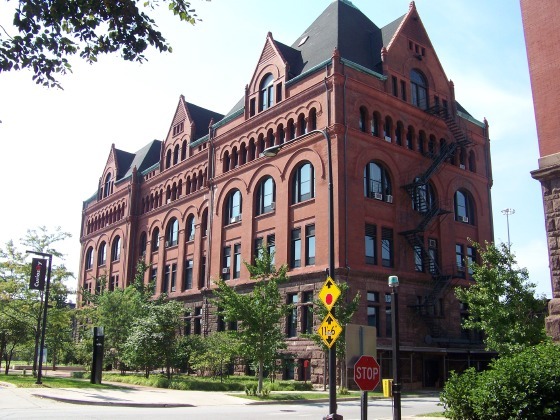 With an enrollment of 7,000 students, the largest engineering school in the country had been formed just six months earlier with the merger of Lewis Institute of Arts and Sciences with the Armour Institute. At the gathering Wilfred Sykes of Inland Steel makes it clear that the city's continuing development dependson its having a great engineering school, saying, "Over 20,000 engineers are employed in the Chicago industrial area. The increase in the rate of employment of engineers in Chicago exceeds that of any other city in the United States, and the number of engineers in Chicago in comparison to the total number of industrial workers exceeds that of any other city."